Designing products and managing cash flow are just a few of the lessons taught by this free, printable business plan for bars, pubs and grills within the restaurant and customer service sectors. 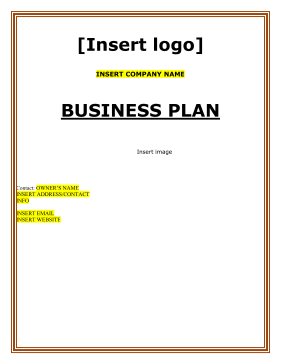 COMPANY NAME will be located in INSERT NAME subdivisions of INSERT LOCATION. The restaurant will provide a moderately priced, quick-casual style restaurant serving fresh food. It is this Company's intent to become the leading quick-casual restaurant in this area. To do so, INSERT NAME is applying for $545,000 in grant money, to support its plan to purchase real estate start-up equipment for both the kitchen and the dining room as well as to cover legal expenses, permits, design and engineering costs. INSERT NAME also intends to take out a loan in order to cover the cost of purchasing the land and construction costs for building the restaurant & surrounding campus. The Company is projecting annual sales to exceed $2.5 million by the end of the third year. COMPANY NAME will operate in an established area of INSERT LOCATION implementing its past experience within this Industry (currently operating the number one restaurant out of 13 franchises), Our plans are to take advantage of an opportunity to capture a large market in this under served area of town. COMPANY NAME competitive edge lies in the quality of the food it produces, which goes hand in hand with the professional service it offers. INSERT NAME plans to expand so that he can fulfill the needs and desires of its guests, at a high level, while still paying attention to the details that will provide patrons with a fun and family friendly dining experience. 2. Complete drawings, obtain permits and all necessary licenses. 3. Construct the building and therefore stimulate and fuel neighborhood growth. 4. Complete construction and be operating within 6 months. 6. Improve & support these communities. 1. Provide a fun and friendly work environment, treating the Company's employees with dignity and respect. 3. Apply standards of excellence to the food production, preparation, and service to its guests. 4. Build lasting relationships with the restaurant's employees and guests. 5. Contribute positively to communities and the environment. 6. Recognize that profitability is essential to future success. 1. Good leadership skills with 6 years of experience leading the number Berryhill1 franchise restaurant in annual sales. 2. Good location with minimal competition in this established community in [CITY], [STATE]. 3. Strong network team at existing location in the [CITY] Heights. 4. Quality food offered at affordable prices. 5. Atmosphere - COMPANY NAME is a casual & exciting dining experience.